You know what’s in it – bread is only flour, water, yeast and salt. That’s it. That’s all you need to make a world-class loaf. Have a look at the ingredients listed on the side of a commercial loaf and ask yourself whether all of those things are really necessary, or are they there just to help the producer turn out a flimsy loaf as quickly as possible. Another important point – bake your own bread, and you know how much salt is in it, and it’ll be a more sensible amount than in most commercial loaves. It’s good value – my normal loaf costs about sixty pence to make, and I drive the cost down further by baking four at a time and freezing three. You’ll be lucky to find any palatable bread available in a supermarket for less than a quid. It’s good for the soul – baking bread is a calming, relaxing activity. It requires patience and time. A good dough needs space to grow and develop its character. Embracing the idea that good things come to those who wait isn’t such a bad thing, really. It tastes far, far better – this is the real reason … your bread, the bread that you made yourself, the bread that you put your heart and soul into, is always going to taste better than a mass-produced loaf. I’d be prepared to go so far as to call this an indisputable fact. You’ll have to give it a go yourself to prove me wrong, and that won’t happen, because that loaf you make will do exactly the opposite – it’ll prove me right. Here’s an easy, step-by-step recipe for a decent white loaf, and the techniques and ratios can be bent to accommodate any type of flour or loaf. You might want to be more adventurous, so have a go at a loaf made with apples, or maybe an authentic baguette, or you could just jump in at the deep end and go for the mother of all loaves, the sourdough. Whichever you try, savour the process as much as you enjoy the bread. Every single part of this is completely true Rich. Hopefully more people can be convinced! 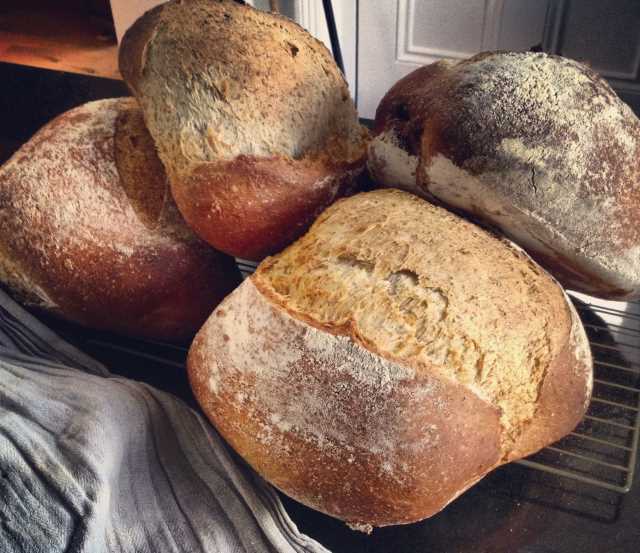 Great post, I can never understand why more people don’t make their own bread – for a while now I have been knocking out batches of beautiful, experimental sourdough for a lower cost than a bag of processed sliced bread. A regular loaf in my home is made using a rye starter and caraway seeds and rosemary added to the dough – a concoction I would definitely recommend.